It used to be that traditional metal braces were the only way to straighten crowded or crooked teeth. But now, dentists can straighten teeth without braces using a treatment called Invisalign. Invisalign is an alternative to braces but has minimal impact on your lifestyle. They are also less intrusive and work discreetly for people of any age. The Invisalign plan uses a series of aligners made of a thermoplasticmaterial to straighten teeth, fix overcrowding, gaps, overbites and underbites. Resembling teeth whitening trays, they slip on over your teeth and remove easily. Using advanced digital technology, Invisalign is custom made for your teeth based on X-rays and impressions taken by your dentist. A virtual treatment plan is made for your individual needs with several sets of aligner trays used to shift your teeth gently and gradually into place. The final result is straightened teeth and a brighter, more confident smile. No, getting X-rays and impressions of your teeth does not hurt. However, after the aligners are custom made to fit your teeth and put in place, there may be some soreness or pressure during the first few days. This indicates your teeth are shifting and the straightening process is working. Drs. 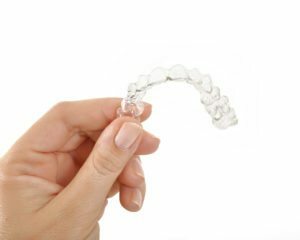 Smith and Robinson, the dentists Lexington, SC and Columbia, SC have trusted for years for conscious, comprehensive care, will customize your aligners for you to achieve maximum comfort. Your dentist will use a series of aligners during your treatment, each one designed to move your teeth slightly closer to their final position. Each set is typically worn for 2 weeks, and after wearing 3 sets (normally 6 weeks) you will return to the dentist for a progress check. The average time for adults in treatment is 12 months, but your total treatment length depends on the condition of your teeth and every case is different. A consultation with the dentist Irmo, SC calls for quality dental care will help you determine how long you will need to wear your aligners. How often must I wear Invisalign aligners? Aligners should be worn all day and night but can be taken out when eating, brushing and flossing. They work best when worn between 20 and 22 hours per day. Will they affect what I can eat? No. Since the aligners must be removed prior to eating and drinking, you can maintain your regular dietary habits. It’s important to brush and floss before reinserting your aligners to maintain dental hygiene and fresh breath. But unlike with traditional metal braces, you never have to worry about foregoing your favorite foods while in treatment. While many people assume Invisalign will cost much more than traditional braces given its many advantages, the cost of the treatment is comparable in most cases, with the average at $5,000. The cost can range anywhere from $2,000 for very simple cases to $8,000 for more complex cases requiring many sets of aligner trays. If your interest is to straighten your teeth without braces and you want a consultation for Invisalign, contact the dentist Lexington, SC has long recognized as a leader in restoring smiles and enhancing dental health, Drs. Smith and Robinson. Invisalign, like traditional braces, is often partially covered by dental insurance plans. The amount of coverage varies widely from plan to plan. Check with your dental insurance provider for the specifics of your orthodontic benefits. If you’re considering dental treatment to straighten your teeth without braces, the Invisalign system may be a good option for you. To learn more visit or contact Drs. Smith & Robinson in Lexington, SC. We serve the residents of Lexington, SC, Columbia, SC, Irmo, SC and surrounding areas.